HMMMMMMMM! Jugs, you say! Actually the word has precisely the same meaning as pitcher, and when discussing the shape with Australians, you quickly adhere to their nomenclature! We wonder whether our acquisition of this purple jug from a delightful couple in the Adelaide area is confirmation of yet another color of our beloved Carnival Glass which MAY have been sent to that region of the world for marketing, creating the extremely scarce availability in USA? Perhaps IMPERIAL produced this color especially for the Australian market? Certainly many rare items have returned from that Country. From the time during the 1960’s when Triplett’s were active in collecting Carnival Glass, and making trips to this Country from Australia, to the present, we have come to discover that certain pieces turn up in their part of the world frequently. Ice Blue threaded Butterfly bonbons, Sunflower bowls, and Poinsettia bowls made by Northwood are prime examples of that practice. POINSETTIA milk “jugs” are actually quite available in marigold, and usually VERY brilliantly iridized. The beading used profusely throughout this significant design, captures light particles which lends a delightful uplift to the overall appreciation of the piece. Helios, (YES! It was intended to be that shade of green); which is a watery green base glass color with a silvery overcast, scarcely seen in this pattern. Emerald green jugs are not often found. Smoke examples are quite rare and command high prices. When approaching the very rare status of the purple jugs, any collector will tell you they have seen very few. Years pass without one appearing in any of the auctions. The last recorded sale was two years ago during the internet CGA Club convention auction when one sold for $3500! This pictured example arrived after six weeks of difficulty in one form or another! It most assuredly was worth the agonizing wait. It is a superb example and we have waited at LEAST 15 years for it to be available to us. Some things just take awhile longer than others, once the heart’s desire is set into motion! (smile) Can’t take our eyes off it! You know what they say about your favorite piece of Glass?………It’s the last piece you bought. Some truth to that. 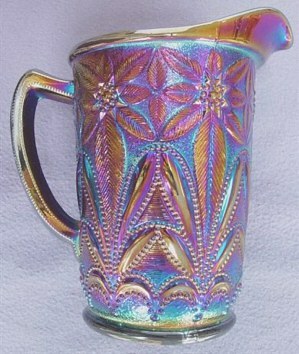 A small jug by most standards, it is 6 ½” tall, with a base of 3 3/8” x 4 ½” in width. The pattern appears on no other shape. OCTAGON milk jug is certainly in the same extremely rare classification as the purple Poinsettia! 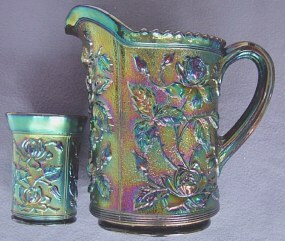 There are three sizes of jug in this well-known pattern. This 8” mid size is plentiful enough in marigold but very rare in purple. 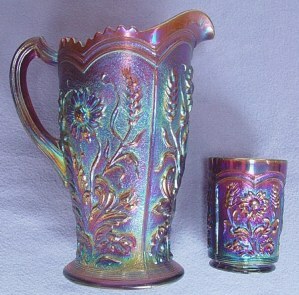 The water pitcher stands 10” – again fairly available in marigold, but very rare in purple. Same situation exists for the small 6 ½” milk pitcher. 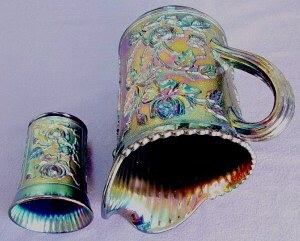 Tumblers were made only to accompany the tankard size jug. Ordinarily, none of the milk sizes have matching tumblers, no matter the pattern .4 ½”w. x 3 ½” base. The pictured example was “discovered” on the bottom shelf of a cupboard in the small mountain town of Hemet, CA some twelve years ago. We had roamed the shop and were on the way out, when Dean asked whether I had noticed that dirty pitcher? I had NOT! We went there, and as I picked it up, chunks of dried earth fell from its crevices onto the floor. The shop owner quickly dropped the price, apologizing somewhat for the filthy condition. With some ammonia water and a scrub brush, we discovered no damage at all, just the show stopper you see before you! THAT was our lucky day! FIELDFLOWER pattern appears only on a water set and a very rare milk pitcher, one of which has not sold in any carnival glass auction for many a year! They have been reported in marigold, purple, clambroth, and helios. For that matter, the water sets in any of the known colors of marigold, purple, helios, amber, blue, (violet) can be termed scarce. Two tumblers in red have been noted, but we wonder whether the IG mark found on the reproduced red sets could possibly have been ground off and polished to take after-market advantage?? We have SEEN the results of that act on OTHER known reproductions from IG derivation. The set shown here would classify as on the lavender/violet side of purple. We bought the jug from Bob and Sherry Cyza as they described it to us during an ICGA Convention sometime ago. It was shipped to us on our return home to San Diego. During the same Convention in Kansas City, Jim and Jan Seeck sold us this tumbler from their room at the hotel. Amazingly, the two pieces match very well! As we move through this segment, you will better understand the intervention of personal contact in order to put a collection together. Association and contact with OTHERS becomes essential. The interface of human comparison through conversation and judgement results in incomparable knowledge not found in reading books……The jug stands 9 ¼” high x 4 3/8” base x 4 7/8” at the widest opening. FASHION - This near-cut pattern is very likely familiar to many. The marigold water sets are found most anywhere you look. Other shape offerings include punch set, breakfast set (composed of small creamer and sugar without lid), 9” ruffled and an ice cream shaped bowl, a rare rosebowl, and a rare compote, beautifully executed in Smoke color. 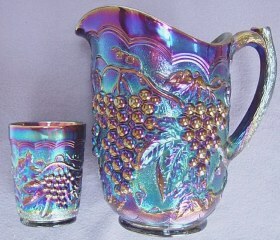 Additional colors found in the water sets: smoke, purple, with tumblers known in clambroth, and root beer (amber) Jug is 8 3/8” h x 4 5/8” base x 6” w.
This jug was purchased in 1991 from an ACGA Convention auction held in Parkersburg,WV, when a longtime collector sold off some of his collection. You can expect to pay upwards of $1600-$1700 today for a supreme purple example. The tumbler in purple is another very scarce-expensive commodity. Ours was purchased from Larry Yung. Mary and Larry have been collecting and dealing in some of the very best Glass for as long as we have been in the circles. The tumbler was for sale in their room at the same Convention. When we asked whether he could take any less for it, ( which IS the standard question when buying from an individual), Larry’s smiling reply was, “ I don’t WANT to.” So, we paid the $90! We have not been where one was available SINCE! After one learns about the scarcity of some items, it is BEST NOT to stare opportunity in the face! LUSTRE ROSE is such a well-executed design, appearing on a confirmed eighteen different shapes. An old catalog of products indicates this and Open Rose were designated as Imperial’s #489 pattern. The standard water sets such as you see here are known in marigold, purple, helios and amber. The pattern is “taken for granted”, but as you may have already assumed, these dazzling purple sets are very rare and desirable. This standard version has a ribbed interior on both jug and tumbler and exhibits a rayed star on the base. . The variant pieces have plain interior and plain base. They are more difficult to locate than this standard version. No purple variant water sets have been confirmed, nor have helios or amber colors. The variant examples in marigold and clambroth have been documented. Jug is 8 3/8” tall x 4 ½” base x 5 ½” w.
Butter dish, covered sugar, 9” plate, footed bowls in 9”, 11-12”, fernery, and centerpiece bowl, along with a rose bowl, and a whimsey vase fashioned from a tumbler are significant others in this pattern which often times is overlooked. The pattern was reproduced in the ‘60’s and ‘70’s. One such offering is an 11” chop plate, an item not originally made in the old Glass. All items were factory marked with either IG, LIG or ALIG logos. CHATELAINE represents top of the line Imperial. The mold work is flawless, but to locate a set without damage is asking for a miracle! Only found in purple, the results of which can be beyond belief! Chatelaine water sets appear in the mid spring edition of the 1913 Butler Brothers Wholesale Catalog, in company with other confirmed patterns from Imperial. These geometric or near cut designs can be found in various patterns because Imperial produced clear pressed glass before entering the Carnival Glass arena. It should be said that their iridization process was superb! Whether the color be marigold, purple, clambroth~~(most assuredly an intended color), or smoke, which they produced more of than any other company; the majority of examples would be difficult to surpass for beauty! Jug is 8 3/8” h. x 3 ½” b. x 5 1/8” w.
A Chatelaine jug and one or two tumblers is a major endeavor, we found. These pieces are free of problems, so there was much competition for ownership when we secured it from a Mickey Reichel auction during the past five years. We decided it is far more important to have such as this, than a down payment for a new car…………and THAT’S the T R U T H! IMPERIAL GRAPE Just as Northwood relied on their Grape/Cable pattern, this grape design could be called Imperial’s “bread & butter” design. Extensive offering of shape and color includes at least 25 various shapes, and the usual color range along with vaseline, lime green and top billing for an ice green tumbler! If variety is what you strive for, it certainly is offered with this lovely pattern. It would be difficult to determine which shape is most appealing, perhaps. Even for pattern collectors, we find as much happiness in the single handled nappy, the 9” plate, the water bottle, and this water set~~all in glorious purple, as we do in our blue 6” plate. Which would we part with first? Not sure about that. The jug makes a statement all its own. Not long before we came to IN to live, word circulated that Wally had brought a lot of his great old Carnival Glass down from Northern CA to sell from a motel room in the Ontario area, just north of L.A, so we drove up from San Diego to see what was left. He’d been there for a couple of days before we received the word. Now anyone who knows Wally McDaniel will verify that before he became enraptured with that un-iridized commodity called “Beanie Babies”, he collected only the very BEST examples of Carnival water sets, so this one you see before you was purchased that day from Wally. The interior of the pieces shown have a slightly ribbed affect inside. Not all six of the tumblers we bought that day have this interior. 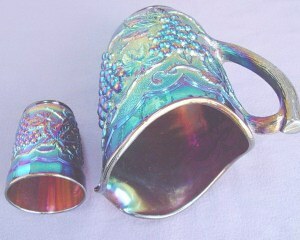 We were more interested in having matching iridescence than a concern for or against the interior ribbing. Three tumblers have smooth interiors. We understand Wally is now enthralled with Fostoria’s Brocade pieces, so Carnival Glass won his heart again! 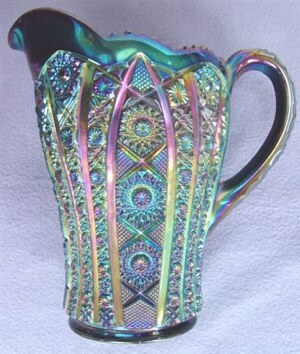 This jug is 8 ¼” h. x 4 3/8” b. x 5 3/8” w.
DIAMOND LACE - Designated as Imperial’s #434 ½, this design appears in their catalogs. 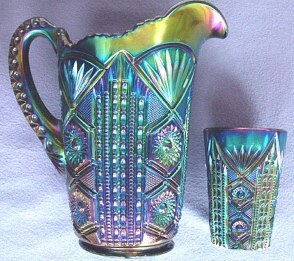 It is probably the most easily identified of all the cut patterns iridized by Imperial. It is next to impossible to find a water set in purple which is other than spectacular in color. They make a stunning appearance from any angle. No other manufacturer could duplicate the magnificent luster displayed on their purple Carnival Glass. The 7-8” bowl in this pattern was reproduced in the ‘60’s-‘70’s with the IG trademark. IF that has been ground off, you may notice a peculiar area of “stippling” in its place. Be watchful. The jug stands 8 5/8”h. x 3 5/8” b. x 5 3/8” w. A cute little whimsey rose bowl was shaped from a marigold tumbler. There are 5” bowls in marigold and purple, along with 8-9” bowls in marigold. Tumblers are known in marigold, but no marigold jugs have been confirmed. This was one of our first water sets, and GUESS who the competitive bidder was? We drove from San Diego to the Northern CA Carnival Glass Convention held in Sacramento that year in the late ‘80’s, to find, among others, Wally McDaniel in attendance at the auction. He and Dean went head to head on this complete set. 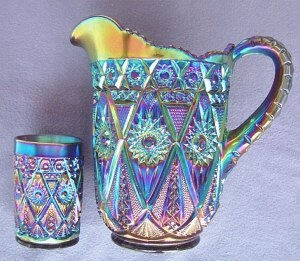 The six tumblers match the jug, which is most unusual. It took at least five years for the price we paid to catch up with what could be termed a “normal” price. We all overpay once in awhile. 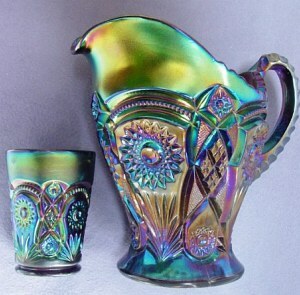 Each of the handles on these jugs was molded along with the pour for the jug itself, therefore you will see significant indication of the overspray from application of iridescence to the body of the piece. Unfortunately, such handles receive a “hit and miss” application of color. We must accept that as a production circumstance. It should NOT be considered a flaw, nor a detraction which reduces value on an otherwise product of quality. Of the four cut patterns and four molded examples exhibited in this segment, we believe that most true collectors will agree that none is more beautiful than another. Our desires consider them with near equal approval. This is another leading indicator of our relentless pursuit for yet another example of this extremely captivating glass.